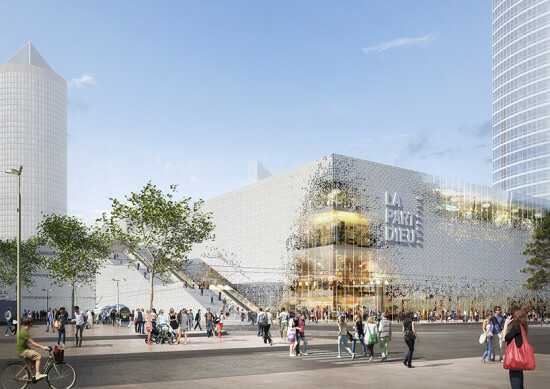 The Part-Dieu shopping center in Lyon, France, will be renovated by Dutch firm MVRDV as part of a wider scheme that will give the whole area a much needed face lift. Using what appears to be fractal aesthetic, parts of the facade appear to dissolve, revealing space within. The mixed-use development will house commercial and leisure facilities and supply a generous offering of public space including a roof garden. Such is the nature of the facade that the building becomes increasingly legible at street level, with the fragmented facade almost falling away, creating viewports and allowing people to see inside. This repetitive facade pattern is employed throughout the whole scheme unifying each individual program. Views from inside are also given significant attention, with the metallic tower of Fourvière and Lyons Basilica Notre Dame being awarded framed views. In the process of redesigning the area, MVRDV added 344,500 square feet of new space while installing a general hierarchy to the site, with lower levels being primarily for retail and upper levels for recreation. By moving the pre-existing car park, MVRDV was allowed to include green spaces and terracing while organising the site so that nearby transport could provide easy-access links to and from the area. By allowing public life to manifest within the vicinity, the scheme can easily coalesce with urban life in the general area. This aspect is amplified by the fact that the street and a railway are allowed to cut through the building as well as over other parts of the scheme via escalators and elevated walkways. "The terraces turn the vast roofs of the shopping centre into open, green space in which the public can meet and relax; a quality that is currently missing in this area," said Winy Maas, co-founder of MVRDV, in a statement. "By rearranging the programme, we create an urban platform that is somewhere between tranquil park and vibrant market square, recreating an atmosphere inspired by the Lyon river side." "The redevelopment of the Part-Dieu commercial center is an opening act towards the city” continued Maas, "The formerly enclosed and defensive block is peeled open and thus becomes a place for the public to inhabit. It becomes part of the city." The Union is founded on the values of respect for human dignity, liberty, democracy, equality, the rule of law and respect for human rights, including the rights of persons belonging to minorities. These values are common to the Member States in a society in which pluralism, non-discrimination, tolerance, justice, solidarity and equality between women and men prevail. Le Monolithe was designed with sustainability in mind. The complex features environmentally sensitive rainwater management practices and uses renewable energy for 80% of the total energy consumed, including the use of photovoltaics. 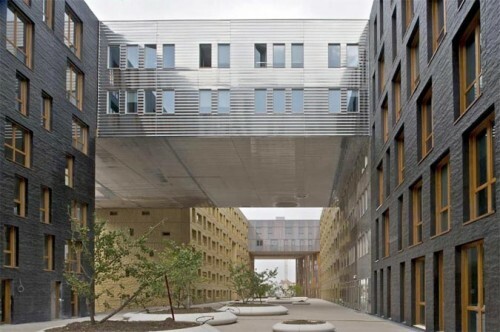 MVRDV designed the project master plan and the front portion of the building, but subsequent layers were each designed by different architects, lending a variegated feel to the overall design commonly achieved through the organic addition of architecture over time. Participating designers include Pierre Gautier, Manuelle Gautrand, ECDM and Erik van Egeraat. Landscape architects West 8 designed the public plaza.